We’re just a week away from the fall semester! I was a little disappointed last year after my pitch for a “History of the Book” special topics class was deemed too controversial. The short, and more accurate version, was that the interdisciplinary nature of the proposed course intersected (or rather interfered) with too many discipline’s learning outcomes… In short, is this a History course, or does it belong in English or Visual Arts? Alas . . . the ongoing debate that leads to no resolution (despite my suggestion to co-list the course and embrace interdisciplinarity, which universities across the nation claim to now embrace). The Chinese and Japanese devised ways to use mulberry bark as paper. Ancient Egyptians learned how to use papyrus from the marshes to form scrolls on which they wrote. In Massachusetts, a printer advertised that his linen rag paper was obtained from the linens of Egyptian mummies that had been purchased for their rag content only. This course addresses the development of writing, writing materials, and written communication technology from 3,000 BC to 1800 AD. It specifically examines similarities and differences between the development of writing and paper across Africa, Southwest Asia, South Asia, East Asia, Europe, and the Americas. Students will engage in hands-on activities as a way of learning in addition to traditional classroom techniques. The course takes a thematic approach to comparing development in the East versus the West by choosing a specific human activity and comparing its development and uses at different places around the globe. Although the course will be run, in part, like a traditional Humanities seminar, I am also treating it like a lab course. There are a variety of experiments, workshops, and hands-on activities supplemented each week, ranging from making our own paper, binding books, paper and book restoration, and even playing with clay, paints, etc. (to get the feel of pre-paper work with tablets and the work involved in making illuminated manuscripts). I plan to occasionally post updates on my own blog, the entire class will be documented on the course blog I set up this weekend. 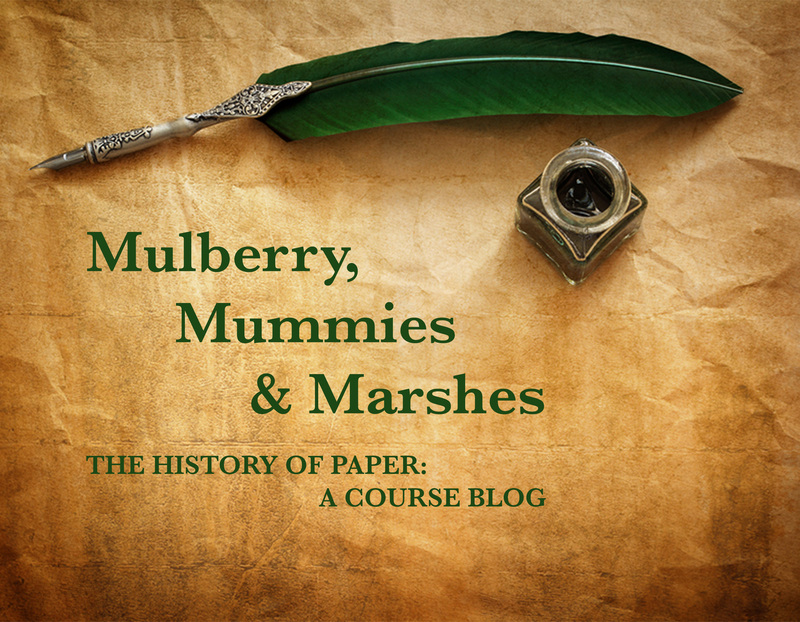 These experiments and class process/progress can be followed in just one week at: Mulberry, Mummies & Marches 2017: A Course Blog. This entry was posted on August 21, 2017 by k.a.wisniewski in Art, Books/Book-making, History, News, Paper, pedagogy, Printing History, Teaching, U. S. History, Work Report / Progress, Writing/Publishing and tagged book history, History, Paper, papermaking, Printing History, Teaching.